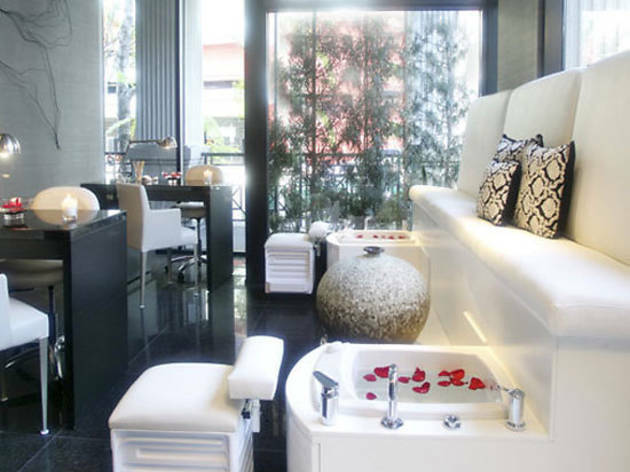 Things to do Fairfax/Beverly/La Brea/Third St.
LeSpa is a beautiful, serene spa attached to the Sofitel, although, unlike some other hotel spas, you don't need to go through the hotel lobby to get to it—it has a seperate entrance, which is nice. Everything at LeSpa is thoughtful—from the uber-comfy chairs in the waiting area to baggies in each locker for jewelry, as well as fresh flowers at the head of the massage table which are removed right when you lie down, leaving a lingering scent of orchids during your treatment. The massages here are top-notch—the therapist's hands will never leave you, and hot towels keep you warm during treatment. Everything is up to you—the lighting, the music, the pressure (of course), and the staff is gracious and accomodating. If you're feeling extra decadent, you can get an add-on to your treatment, such as a hydrotherapy bath. Soak surrounded by candles and fresh flowers, and take your time primping and preening in your own private changing room—you can even order lunch.